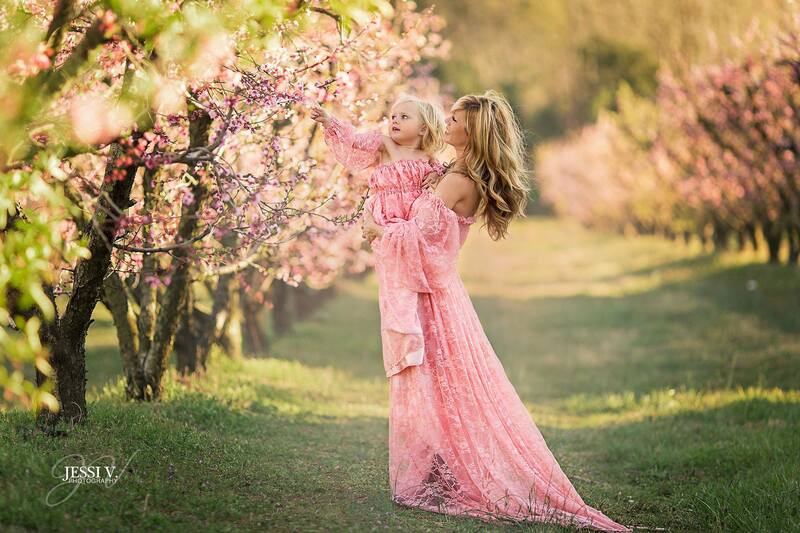 It's springtime, folks, and that means that it's a prime time to get outdoors with your mommy and me clients and create portraits that are light, bright, and full of color. 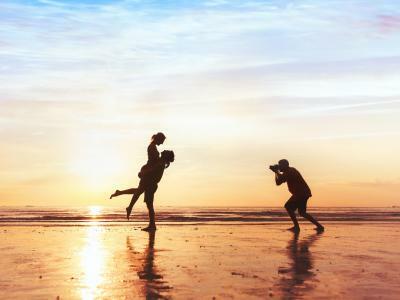 That might sound like a straightforward undertaking, but there's a little more involved in capturing beautiful portraits than simply putting your subject in a pretty environment. 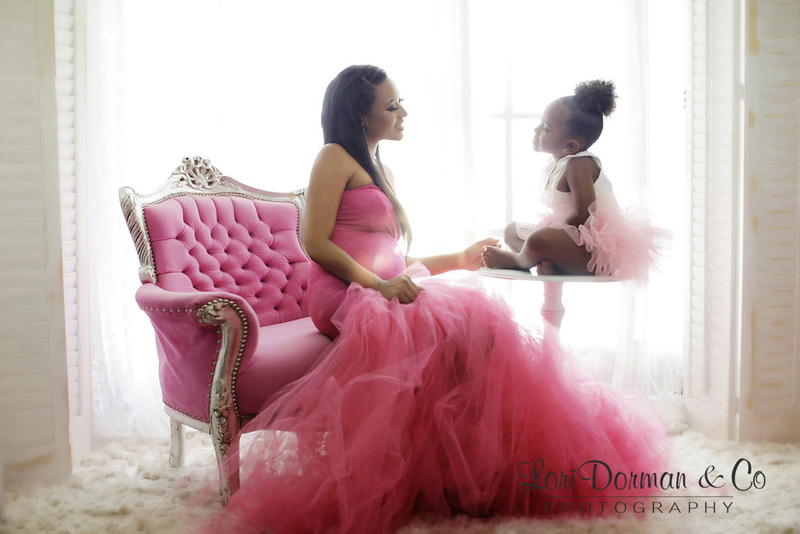 In this guide, I highlight five mommy and me photo ideas that will give you high-quality results. Springtime is perfect for outdoor portraits because there's an explosion of color in the landscape. 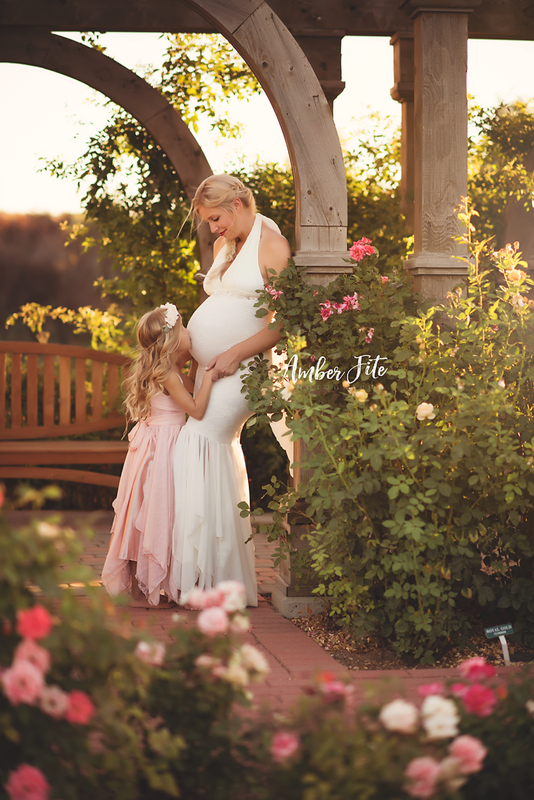 An ideal setting for a mommy and me photo shoot is a garden, where you can incorporate the various colors and textures of the flowers into the shot. In this example, the photographer smartly chose to shoot from a lower eye level to bring the flowers into the foreground of the shot. But because they're gorgeously blurred, they also help to define the space and give the image more depth. 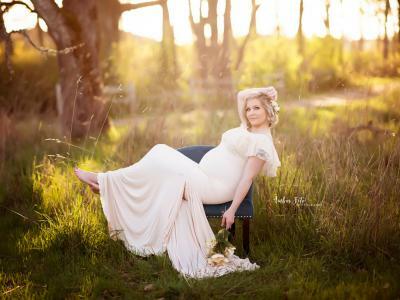 Using colors and textures in this way - to create dimension - is a surefire method for getting improved maternity photos. Editor's Tip: Earn extra income by joining our preferred affiliate program. Find out how to join today. Adding structure to a mommy and me portrait (or any portrait, for that matter) will help make sense out of the chaos. In this case, the strong presence of the columns gives some verticality to the image while helping to restrict the movement of our eyes to the center of the shot where this gorgeous mom and daughter are posed. Similarly, the railings in the background help screen out some of the background elements, and, again, help keep our eyes focused on the subjects. The structured look is also a little more formal, so pairing it with a beautiful mommy and me matching set can complete that formal look. If you find that the location in which you're shooting has a lot going on in the background, try to find ways to add structure to help manage those details. Of course, springtime doesn't just bring beautiful colors, but it also brings great light and warmer temperatures. That means you can dress your models in gowns that are sleeveless or even off-the-shoulder without worrying that they will be chilled. In this case, the subdued look of this shot gives it a clean, fresh appearance. The relatively featureless background works well in this instance because it allows the gowns that the models are wearing to shine - you can really see the detail of the sleeves and hemline, in particular. A simple setting like this also allows you to focus more on the relationship between the two subjects. Having them touch in some way, in this case, with mom's hand on her daughter's head and arm, helps to strengthen the visual representation of that relationship. Sunset is an ideal time for springtime portraiture because of the color of the light. As you can see above, the light is warm, soft, and golden, and illuminates the background in a way that gives the image more life and vibrancy, but without distracting attention from the subjects. When taking a sunset portrait, finding shade to place the subjects is an ideal way to skirt the exposure problems that can occur when shooting in direct sunlight. Another tip to learn from this shot is that by coordinating the wardrobe with the surroundings - in this case, the pink flowers on the trees - you end up with a photo that has a cohesive, uniform look. 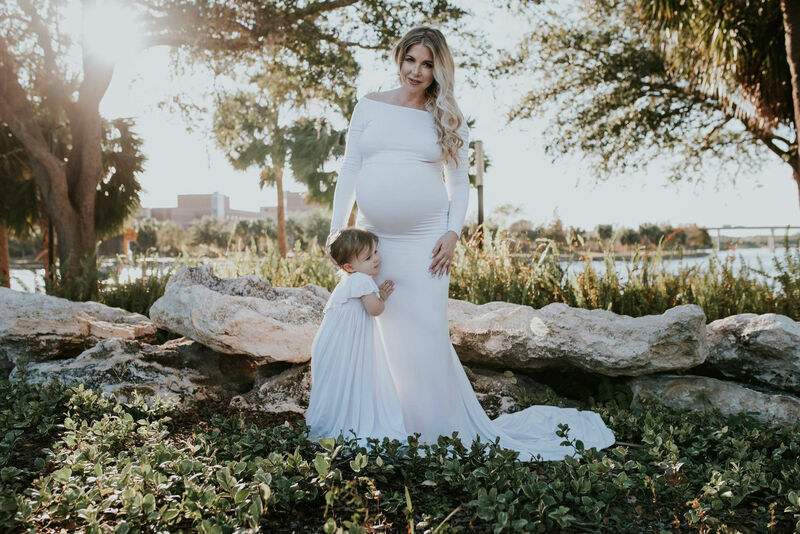 Editor's Tip: Get outfitted with all the maternity photography accessories, newborn accessories, and mommy and me accessories you need to make your photos shine. Start shopping now. Sometimes, all you need for the background of a portrait is a lot of light. As you can see here, by overexposing the background, the photographer created a light, bright, and airy portrait in which this mother and daughter can take center stage. By pairing the bright white background with the deeply saturated tones of the pink chair and pink gown, you get a gorgeous contrast that immediately grabs your attention. Better still, this look can be achieved in front of virtually any window that faces the sun. 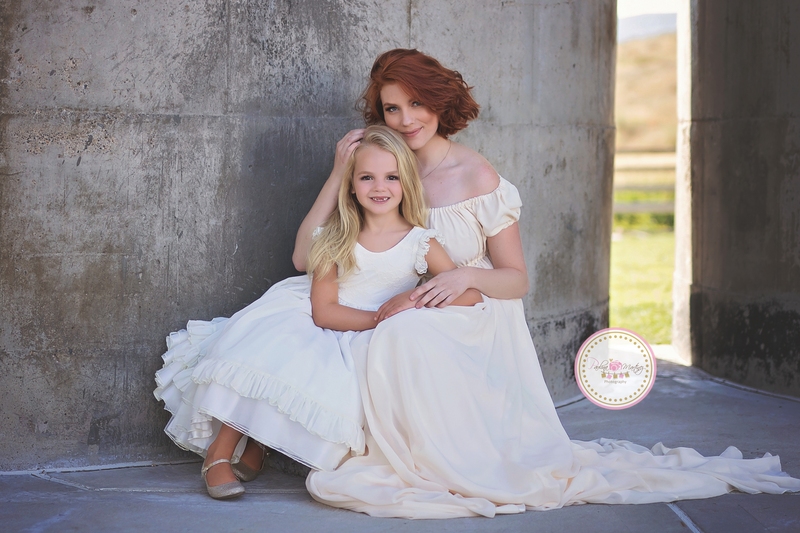 These are just a few simple tips for mommy and me photography, but they should serve you well to create more unique portraits!